We study the impact of fluctuations in global oil prices on domestic inflation using an unbalanced panel of 72 advanced and developing economies over the period from 1970 to 2015. We find that a 10 percent increase in global oil inflation increases, on average, domestic inflation by about 0.4 percentage point on impact, with the effect vanishing after two years and being similar between advanced and developing economies. 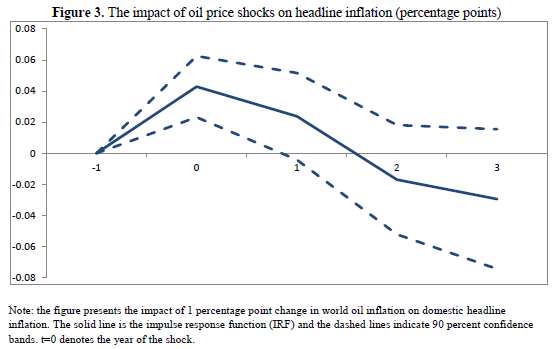 We also find that the effect is asymmetric, with positive oil price shocks having a larger effect than negative ones. The impact of oil price shocks, however, has declined over time due in large part to a better conduct of monetary policy. We further examine the transmission channels of oil price shocks on domestic inflation during the recent decades, by making use of a monthly dataset from 2000 to 2015. The results suggest that the share of transport in the CPI basket and energy subsidies are the most robust factors in explaining cross-country variations in the effects of oil price shocks during the this period.